I have watched a number of reality TV shows on which contestants were asked to consume extremely unappetizing foods. You know the sort of thing I’m talking about, I’m sure, so I’ll refrain from elaborating. Under circumstances of sufficient duress or social pressure, I’ll uncomplainingly choke down just about anything, however unpleasant it may be. But there are a few foods that I would find it difficult to get past my uvula no matter how many viewers at home were cheering me on or how many dollars were at stake. I am thinking, for example, of okra. In the United States, okra is known as a staple of southern cuisine, and rarely seen elsewhere. A member of the hibiscus family, okra is a tall plant with yellow flowers and edible seed pods. If you look up okra in a dictionary, the one word that will almost invariably be used to describe the texture of these seed pods is mucilaginous. This word means “glue-like”—that is, viscous, sticky, and slimy. These are acceptable characteristics for adhesives, but not the sort of thing that feels good on my tongue. Having said that, I must now confess that I have personally, voluntarily cooked with okra, and enjoyed the results tremendously. That’s because context is everything. The one dish in which okra is not only unobjectionable but mandatory is gumbo. I first tasted gumbo many years ago on a trip to New Orleans. I decided to brave it, even knowing it contained okra, because it seemed like one of those quintessential Louisiana experiences everyone should have. I absolutely loved it. The surprising thing was that I could not detect any hint of that mucilaginous texture. When I later made my own gumbo, I figured out why. Gumbo is a hearty soup that is one of the cornerstones of Cajun cuisine in Louisiana. There are countless recipes and variations, but it invariably consists of a thick broth served in a bowl with a mound of rice. Some gumbo is made with chicken and andouille sausage; some is made with seafood; some is made with whatever meat happens to be handy. (Purists generally scoff at the notion of vegetarian gumbo.) Gumbo usually starts with a roux (a browned mixture of flour and oil or butter) along with diced, sautéed pepper, onion, and celery. Then a stock is added along with the meat and sliced okra; the resulting mixture is simmered for several hours before serving. When the okra is heated, its mucilaginous fibers begin to dissolve, and serve as a thickening agent for the soup. Depending on how fresh the okra was when you put it in, how small the slices were, and how long you cook it, there may be no visible remains of the okra at all by the time it’s served. If whole pieces remain, they are quite soft but not even slightly slimy—entirely edible. So the very quality that makes whole okra yucky turns out to be essential to making gumbo yummy. There are gumbo recipes that omit okra, but they miss the point. 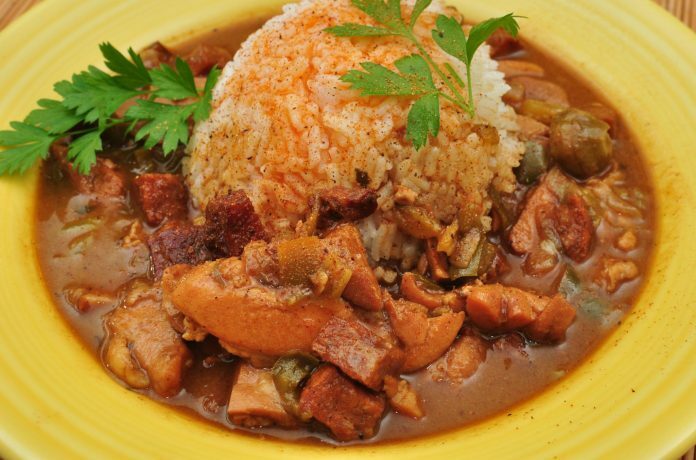 For one thing, the word gumbo is derived from the Bantu word kingumbo, which means “okra.” In other words, gumbo without okra is sort of like oatmeal without oats. For another thing, okraless gumbo just doesn’t taste right. The usual alternative thickening agent is filé, a powder made from dried sassafras leaves. Filé becomes gummy when it’s boiled, so it can’t simmer into the soup. It has to be added just before serving, or sprinkled on at the table. There’s nothing wrong with a filé-thickened soup, but it shouldn’t be called gumbo.